Keith Shepherd and Natalia Luckyanova were just tourists the first time they visited Pixar Animation Studios. The next time? They were game developers, pitching ideas to Disney and Pixar for an upcoming collaboration called Temple Run: Brave ($1.99). Keith and Natalia are two of the three people behind Imangi Studios — the house that built Harbor Master (Free), Max Adventure (Free), and Temple Run (Free) to name a few. Speaking with TouchArcade earlier this afternoon, the husband and wife team expressed just how cool it was to work with Pixar, and they dug into how a collaboration between a massive company and an already busy three-man studio was made a reality. “It was pretty awesome," Keith tells us, describing the opportunity to talk with the dudes at Pixar and Disney Mobile. “Natalia and I have always been huge fans of Pixar and all the things they’ve produced over the years. They make fantastic movies. The Disney Mobile group approached us about doing some sort of a tie-in with Temple Run." After viewing a teaser trailer for Brave, Imangi was sold on the idea of Temple Run: Brave. It’s a good fit. At its core, Temple Run is a game about running in a confined space. Brave’s forest and mountain settings are functionally similar to Temple Run‘s Incan-inspired maze. Keith points out a few other similarities to us, including the protagonists’ hair colors and the fact that they’re always on the run. “We definitely had some surreal moments while working with them. They’re Pixar! They do such a fantastic job of appealing to young audiences as well as adults. Their movies always span the whole range of emotions, from happiness to sadness, to everything in-between. Working with them, I think there was a couple of times where we just had to pinch ourselves and, you know, ask is this really happening?" “Pixar and Disney, these two big corporations that make all sorts of awesome stuff, are working with our small little studio of three people," Keith says. Natalia echoes this, and mentions that Imangi got to watch a version of the movie before it began planning out its video game take on it. As excited as everyone was about the potential partnership, the reality of Imangi’s size threatened the project. There are just three dudes at the studio. That makes it hard to work on a lot of side projects and tie-ins. To make this work, Disney Mobile provided the resources and the heavy lifting, while Imangi would dished out the creative guidance. Imangi positions Brave as an addition to the Temple Run universe, as opposed to a follow-up or spiritual successor. It’s a fair description. 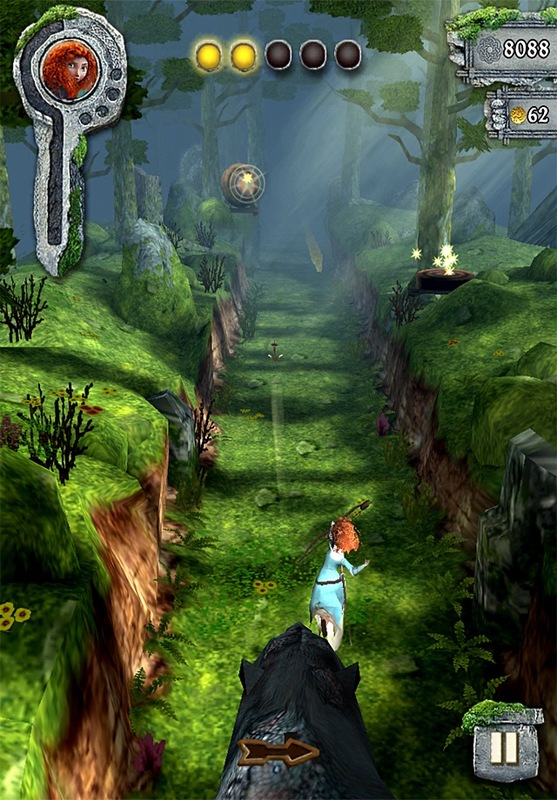 Brave is, at its core, is Temple Run with a few tweaks that differentiate it but doesn’t separate it. “I think we wanted to stay true to the Temple Run gameplay that everyone has kind of grown to love," Keith tells us. “We didn’t want to change much. But we also wanted to give some new elements to make it tie in more to Brave. The archery thing — archery is a huge theme in the movie. From the get-go, we started brainstorming ideas about how we could work that into the gameplay." “You’re going to see more stuff kinda coming down the pipe here," Keith teases. “We’ve got some other interesting things to tie into the game as we go." Our take on Temple Run: Brave as a whole is positive, by the way. It’s a solid iterative game with enough of a new look to feel new, and the introduction of the archery mechanic is a surprisingly good fit. It bolsters the core action without being a nuisance, much like the IAP functionality. Sure, Imangi isn’t re-inventing the wheel with this, but it doesn’t need to. Temple Run is and will forever be a fantastic endless runner, and its made even better by new locations and new characters, as this game displays so well. Give it a look. The rest of our conversation is available in this week’s bonus episode. Among these topics, we also talk about the Android versions of Temple Run and how Max Adventure‘s total failure led to Temple Run‘s creation.